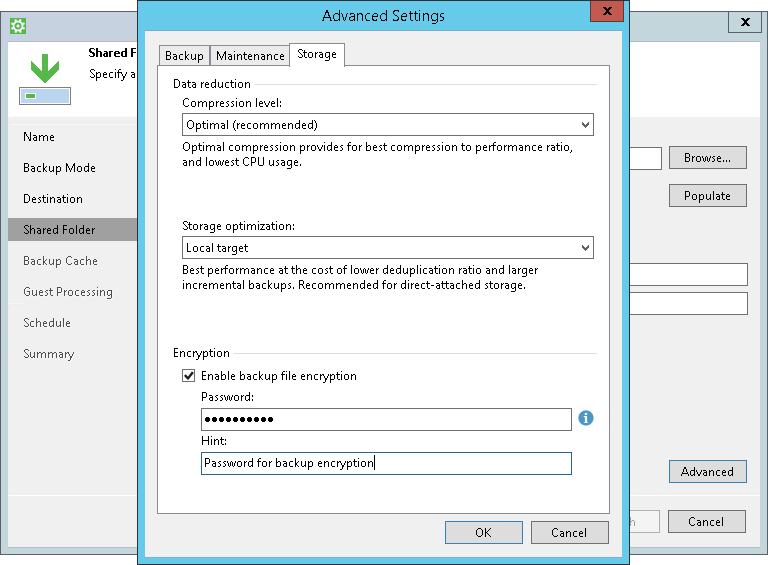 Encryption for the backup job is configured in the advanced job settings. You should enable the encryption option and specify a password to protect data in backup files produced by the backup job. You cannot specify encryption options for the backup job if you have chosen to save backup files on a Veeam backup repository. Encryption options for Veeam Agent backup jobs targeted at the backup repository are managed by a backup administrator working with Veeam Backup & Replication. To learn more, refer to the Veeam Backup & Replication documentation at https://www.veeam.com/documentation-guides-datasheets.html. You enable encryption for a backup job and specify a password. Veeam Agent for Microsoft Windows generates the necessary keys to protect backup data. Veeam Agent for Microsoft Windows encrypts data blocks and transfers them to the target location already encrypted. On the target storage, encrypted data blocks are stored to a resulting backup file. You select an encrypted backup file and define a password to decrypt the backup file. If the password has changed once or several times, you need to specify the latest password that was used to encrypt files in the backup chain. Veeam Agent for Microsoft Windows uses the provided password to generate user key and unlock the subsequent keys for backup file decryption. Veeam Agent for Microsoft Windows retrieves data blocks from the backup file, sends them to the target volume and decrypts them on the target volume.